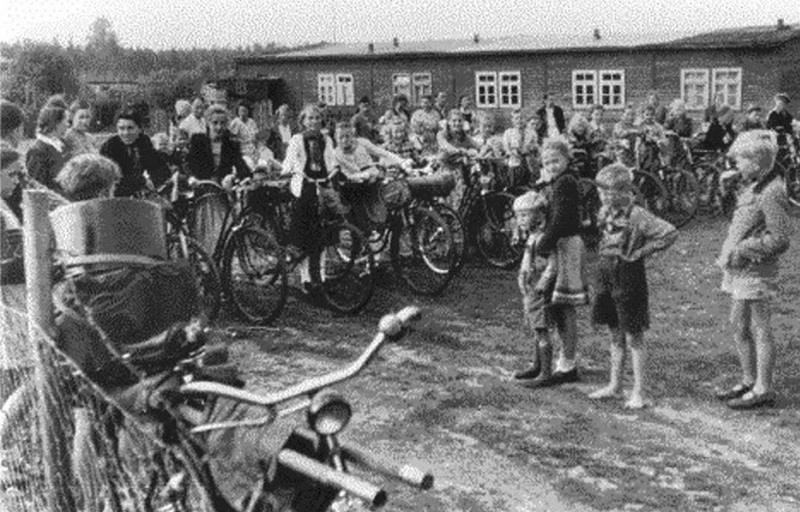 Despite its development towards the detention centre for evacuation transports and the dramatic changes that this meant, Bergen-Belsen retained a function in one aspect: It remained a family camp, not only because the hostage (Geiseln) Jewish families that had been deported, remained in the camp, unless they were exchanged replaced or had been released, but also because, once children arriving with the transports of prisoners since the fall of 1944, who were completely unrelated with the exchange projects that took place from Bergen-Belsen. This was initially the case in the fall of 1944 when transports came from Poland with women who had been arrested in the context of the Warsaw Uprising and were then deported into the camp with their children. in part, since November 1944 came a large number of Sinti and Roma children with their mothers to Bergen-Belsen. The existing data even suggest that the Sinti and Roma were eventually that group of prisoners, with the highest percentage of share of children. Also among the Hungarian Jews, who after the departure of the "Kasztner Group' in December 1944, the Hungarians were sent to Bergen-Belsen camp, as the last part of the group of "exchange prisoners", families that brought their children with them. 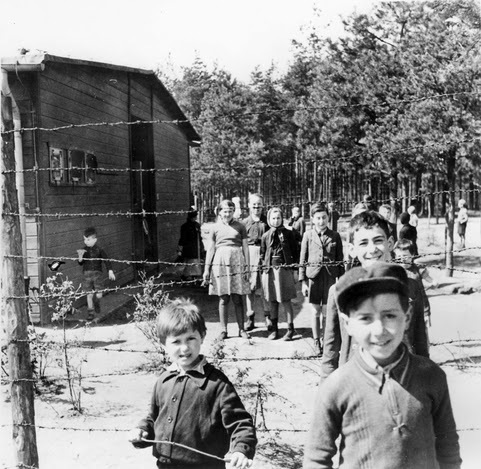 Bergen Belsen, Germany, Children behind a barbed-wire fence, after the liberation, April 1945'. The total number of children, that is, persons up to the age of 14 years, who were at different time periods in the camp can be estimated at about 3,000. About a third of them lived in the Star Camp, where their share, compared with other sections, the total number of this sub-camp was at least 18 percent. Even at the sub-camps, the children until the age of 14 years were living in the barracks with their mothers. Although they were not scheduled or assigned to work details, but had to take part in the dreaded roll-calls from the age of three years and were exposed to the same living conditions as the adults: hunger, cold, fear and diseases, which determined their everyday camp life. They had to accept the same experiences very much as their parents, from which they could not very well protect them. There were only very few possibilities of distraction or the processing of their experiences and fears for them in Bergen-Belsen. Of great importance in this regard was at first an organized and especially in the residence camp, the children's education, which was of course not allowed and therefore had to be disguised as "child care" during SS inspections. The increasing deterioration of living conditions since the fall of 1944, however, led to a gradual decline to continue with this well intended program, the increasing physical and mental powers of the adults were missing. 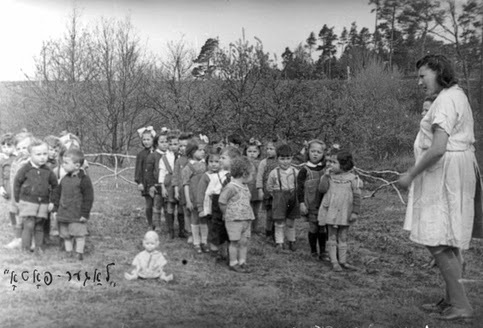 So, what was left to the children often remained only the possibility to play - such games as mimicking the "SS- Appell, Roll Call Game" - to cope with their traumatic life situation. Also, a far greater number of births is documented for the concentration camp at Bergen-Belsen. Overall, it must have been of at least 100 births. The best chances of survival were those children who were born relatively early in the Star Camp or in other parts of the residence camp and could partly leave with their parents in the course of exchange, or release actions from Bergen-Belsen. Other chances of survival had also those children who were born shortly before the liberation and could be treated medically by the British liberators and their support staff a few days after their births. 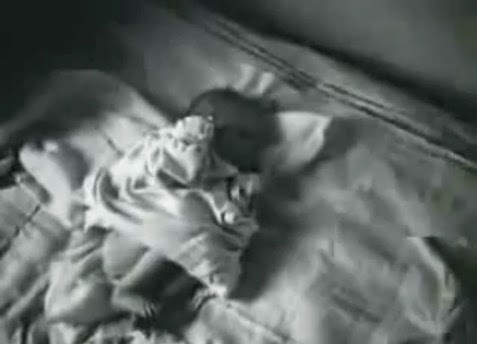 The youngest liberated prisoner in the camp, was a Polish boy who was one day old, he was born on 14 April 1945. The other babies born in Bergen-Belsen, however, had very little chance to survive. Most of the women, who brought children in Bergen-Belsen into this world, were non-Jewish, Polish, apart from few Hungarian Jewish women . Both groups had been arrested until relatively late in the state of their pregnancy, before they came to Bergen-Belsen, the Polish women in consequence of the Warsaw Uprising, the Hungarian women after the German occupation of Hungary and the start of deportations of Hungarian Jews to Auschwitz in the summer of 1944. In the final months before the liberation, there could be no more talk of special privileges in practice for the Exchange Prisoners. They were to some extent treated no better than the prevailing disastrous living conditions as all other prisoners. Suddenly, just a few days before the liberation they received their special and important status again. While at the the same time thousands of prisoners, in the context of evacuation transports, were taken into the main and sub-camps, the more transportable prisoners of the Transit Camp (Aufenthaltslager) had to stay, to get ready for their departure from Bergen-Belsen. With three transports, they left between 6 and 10 April 1945 with a total of about 6,700 prisoners. It was probably intended to bring all three transports to Theresienstadt. However, only one of the trains arrived actually on 21 April 1945 at Theresienstadt, where the prisoners were freed only on May 8, 1945 by the Red Army. The other two trains were finally freed after days of wandering, the first on 13 April 1945 at Farsleben near Magdeburg by American troops, and the second on 23 April 1945 near Tröblitz by the Red Army. For the weakened prisoners the transport meant new hardships. In the liberated train at Tröbitz at least 133 prisoners had died during the trip. 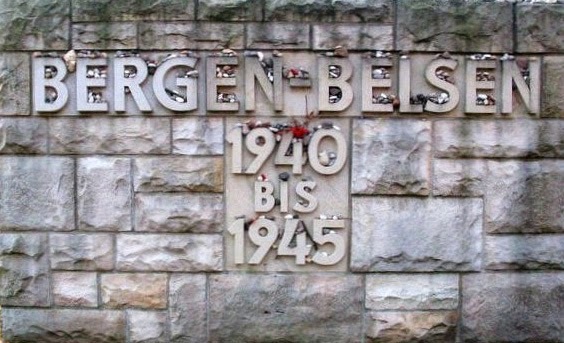 The remaining in Bergen-Belsen prisoners were not freed until the 15th of April 1945 on the basis of a localized ceasefire agreement that was negotiated on 12 April, with the consent of Heinrich Himmler between the British and the German military. It provided for a neutral zone around the camp to prevent the spread of epidemics and to hand over the camp without a fight to British troops. The guarding of the camp should be taken over for the time being instead of the SS, by German Wehrmacht and Hungarian soldiers, who were promised a free retreat back to German front lines. What is unclear, were the rules regarding the SS staff: Provided that the Wehrmacht could maintain order, they should remain in the Bergen-Belsen concentration camp and pass the camp properly over to the British. Disease was kept under control by routinely disinfecting all new arrivals. But in early February 1945 a large transport of Hungarian Jews was admitted while the disinfection facility was out of order. As a result, typhus broke out and quickly spread beyond control. Commandant Josef Kramer quarantined the camp in an effort to save lives, but SS camp administration headquarters in Berlin insisted that Belsen be kept open to receive still more Jewish evacuees arriving from the East. The death rate soon rose to 400 a day. When SS chief Heinrich Himmler learned of the typhus outbreak at Bergen-Belsen, he immediately issued an order to all appropriate officials requiring that "all medical means necessary to combat the epidemic should be employed ... There can be no question of skimping either with doctors or medical supplies." However, the general breakdown of order that prevailed on Germany by this time made it impossible to implement the command. As British forces approached Bergen-Belsen, German authorities sought to turn over the camp to the British so that it would not become a combat zone. After some negotiation, it was peacefully transferred, with an agreement that "both British and German troops will make every effort to avoid fighting in the area." A crowd watches the destruction of the last camp hut, by British Military'. In an "act of revenge," the British liberators expelled the residents of the nearby town of Bergen, and then permitted camp inmates to loot the houses and buildings. Much of the town was also set on fire. By negotiations between British and German officers, British troops took over from the SS and the Wehrmacht the task of guarding the vast concentration camp at Belsen, a few miles north-west of Celle, which contains 60,000 prisoners, many of them political. This has been done because typhus is rampant in the camp and it is vital that no prisoners be released until the infection is checked. The advancing British agreed to refrain from bombing or shelling the area of the camp, and the Germans agreed to leave behind an armed guard which would be allowed to return to their own lines a week after the British arrival. The story of the negotiations is curious. Two German officers presented themselves before the British outposts and explained that there were 9,000 sick in the camp and that all sanitation had failed. They proposed that the British should occupy the camp at once, as the responsibility was international in the interests of health. In return for the delay caused by the truce the Germans offered to surrender intact the bridges over the river Aller. After brief consideration the British senior officer rejected the German proposals, saying it was necessary that the British should occupy an area of ten kilometres round the camp in order to be sure of keeping their troops and lines of communication away from the disease. The British eventually took over the camp. In fact, the majority of SS personnel began on the 13th April 1945 to withdraw from Bergen-Belsen, not having destroyed the camp registration, including the inmate personnel file which they left behind. Only about 50 SS men and 20 to 30 guards remained together with the commander Josef Kramer at Bergen-Belsen, apparently on the assumption that they would also after the handover, be able to leave the camp towards the German lines. But shortly after the liberation they were arrested by the British and initially forced to participate in the disposal of perished prisoners. They had to take the bodies and bring them to the mass graves. Approximately 20 SS-men died in the aftermath of poisoning they attracted through injuries sustained in the process from deceased corpses. Investigations of responsibility against those remaining in Bergen-Belsen SS personnel, the British military took since the end of April in order to provide as soon as possible jusice for the crimes committed in the camp. The British Military Government, however, was not searching systematically after the remaining SS personnel even before or after the liberation of Bergen-Belsen. Of the total of at least 435 men and 45 women who had temporarily been part of the SS personnel in Bergen-Belsen, thus only a relatively small portion was held criminally responsible. 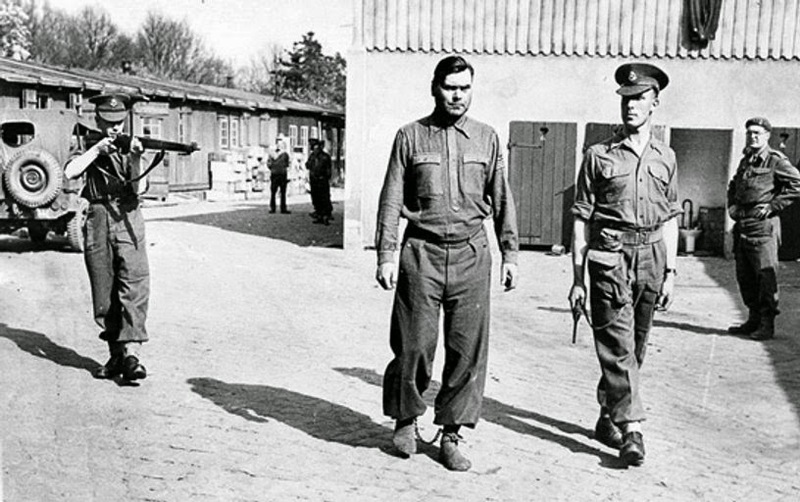 Josef Kramer, photographed in leg irons at Belsen before being removed to the POW cage at Celle, April 17, 1945. On 17 September 1945 began in Lüneburg before a British military court the First Bergen-Belsen Trial. Indicted were 20 men and 16 SS-guards, and eleven former detainee functionaries. Since some of the defendants had been previously used in the concentration and extermination camp at Auschwitz, they had to stand trial in Lüneburg also for their crimes committed there, so the Lüneburg Belsen Trial was not only the earliest war crimes trial on German soil, but also in fact the first Auschwitz Trial. On November 17, 1945, the Court handed down its judgments: Eleven defendants, including the former camp commandant Josef Kramer, were sentenced to death, acquitted 19 to prison terms and 14 acquitted. Agaainst four SS-men no verdict was passed, as they were ill shortly before or during the proceedings. The death sentences were carried out in mid-December 1945 in Hameln. 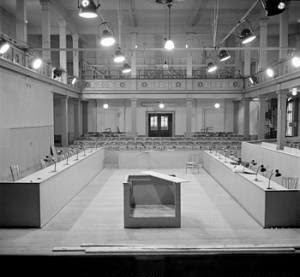 In May 1946, a second "Belsen Trial" took place took place in Celle, it was conducted against ten defendants who either were not at the time of the main proceedings in British custody in the fall of 1945 or due to sickness had not been competent enough to stand trial. Also in this process the court handed down several death sentences and imprisonment: four of the defendants were also executed in October 1946 in Hameln. The Belsen Trial attracted substantial national and international media interest. Significantly more than 100 representatives of the news media reported at length on the trial's progress. Through them, the world learned not just about the thousands of deaths by hunger and disease at Belsen — communicated especially forcefully by the film and photo evidence produced by the British Army. Possibly even more importantly, the Belsen Trial also was the first time that the organised mass murder at Auschwitz Birkenau received a public airing, with some of those responsible describing the selection process, the use of the gas chambers and the crematoria. In Great Britain, the trial was mostly viewed positively, as a triumph of the rule of law, given the fairness and meticulousness with which it had been conducted. However, in some other countries, notably the Soviet Union and France, the verdicts were criticised as too mild. Many of the survivors also felt that way. Working together with both Commandant Kramer and chief inmate representative Küstermeier, Colonel Hanns Schmidt responded by arranging for the local volunteer fire department to provide water. He also saw to it that food supplies were brought to the camp from abandoned rail cars. Schmidt later recalled that Kramer "did not at all impress one as a criminal type. He acted like an upright and rather honourable man. Neither did he strike me as someone with a guilty conscience. He worked with great dedication to improve conditions in the camp. For example, he rounded up horse drawn vehicles to bring food to the camp from rail cars that had been shot up." The camp was not really inefficient before you [British and American forces] crossed the Rhine. There was running water, regular meals of a kind -- I had to accept what food I was given for the camp and distribute it the best way I could. But then they suddenly began to send me train-loads of new prisoners from all over Germany. It was impossible to cope with them. I appealed for more staff, more food. I was told that this was impossible. I had to carry on with what I had. Kramer's clear conscience is also suggested by the fact that he made no effort to save his life by fleeing, but instead calmly awaited the approaching British forces, naively confident of decent treatment. "When Belsen Camp was eventually taken over by the Allies," he later stated, "I was quite satisfied that I had done all I possibly could under the circumstances to remedy the conditions in the camp".sic] He calmly accepted and anticipated his fate, that he would be hanged. After the arrival of British Troops at Bergen-Belsen the work of saving lives continued, in the past week the sick had been moved from the camp to a nearby Panzer training school, that's been turned into a makeshift hospital. Even it's parade grounds were full of beds and straw mayoresses. Soon it wil be the largest hospital in Europe. with 13,000 patients. Some are beyond human aid and will soon die. But they are happy and look forward to living again even though they might know it is only for a short while. Bedpans sometimes double as feeding bins. Fie hundred new patients arrive every day and the British doctors and nurses and the 48 Red Cross volunteers who arrived few days ago are struggling to cope. Lieutenant James Johnston, the senior medical officer at Bergen-Belsen, requested medical personnel from England, and was shocked when a few days later 60 German doctors freed from POW camps arrived. A Red Cross nurse wrote home, 'They strut about in a most alarming fashion terrifying all the inhabitants. However, the British Tommy is marvelous in taking them down a peg or two. On their second day the German doctors ignored an order to parade at 7 am, so Lieut ant Colonel Johnston threatened to hang their senior officer. After that they were more obedient. German nurses were drafted in from nearby towns and cities have added tension in the camp. When a group from Hamburg arrived on a ward for the first time, they were set upon by patients (some of them were dying) armed with knifes and forks. Troops were called to rescue the nurses who were by then covered in blood, their their uniforms torn to shreds. This is the atmosphere Nichel Hargrave and the other volunteers face in the coming weeks. 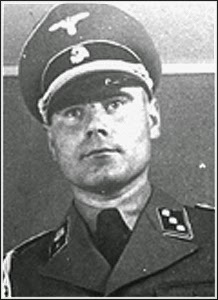 On December 2, 1944 , the previous commander , Adolf Haas, was replaced by SS -Hauptsturmführer (Captain) Josef Kramer, who had last been commandant of Auschwitz-Birkenau , where he was responsible for the extermination of several hundred thousand Hungarian Jews . This change in the command structure also marked the completion and final conversion of Bergen-Belsen into a typical concentration camp. The special conditions for the "Exchange Jews" existed now only on paper. Non-Jewish Kapos from the prison camp were given the control over the Star Camp , which often led to ill-treatment of Jewish Exchange Prisoner by these Kapos , including with their responsibilities and subordinated to them were also the work details(Arbeitskommandos). The former Camp Elder of the prison camp was appointed Camp Elder of the total camp (an ominous sign). With the gradual removal and evacuation of female prisoners from Auschwitz-Birkenau, as the oncoming fighting front was near the concentration camp, which took place since the end of 1944, with a huge amount of dramatic consequences for the concentration camp at Bergen-Belsen , which by its relatively central location in the German Reich , was far removed from the oncoming Red Army , and considered as a prime target to shift these evacuation transports , although it [the camp] was completely unprepared nor suitable to absorb such an influx of multiple tens of thousands of prisoners in any way. When Joseph Kramer on December 2 , 1944, took command , there lived 15.257 prisoners here . With the increasing number of evacuation transports , which were directed [in part re-directed] to Bergen-Belsen , the number of prisoners increased dramatically, despite the rising death rate: On 1 January 1945, the prison population was 18.465 , on 15 January it stood at 22.286 and on March 1, it had already reached 41.520 . In February 1945 came, in just the three months from December 1944 , in this context 40,000 to 50,000 prisoners to Bergen-Belsen. To accommodate these prisoners , the SS saw themselves now forced to install new camp parts . 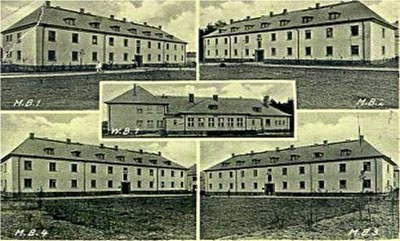 The POW hospital located in the northern camp complex was dissolved in January 1945 and instead a second women's camp ( in historiography called " Large Women's Camp ) established on its premises , while in the southern part for the male prisoners, the prison camp II was established. However, even these spatial expansion of the concentration camp could not provide a total occupancy of the camp without dramatic consequences for the prisoners . Within a short time, Bergen-Belsen became a death camp , the location of a painful mass extinction . 18,168 prisoners died alone in March 1945 from hunger, and quickly a rampant epidemic such Typhus in particular , of which the SS made ​​no serious efforts to combat it took place. 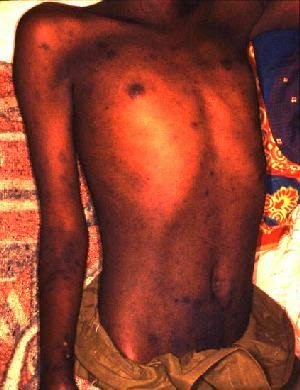 The disease is transmitted by the human body louse, which becomes infected by feeding on the blood of patients with acute typhus fever. Infected lice excrete rickettsia onto the skin while feeding on a second host, who becomes infected by rubbing louse faecal matter or crushed lice into the bite wound. The prevailing conditions since the beginning of 1945 in Bergen-Belsen can be represented reasonably adequate only by the descriptions from prisoner diaries or memoirs of former inmates. In January 1945, Hanna Levy-Haas noted in her diary: "General malnutrition. Only with great difficulty one succeeds to move. No one is able to walk normally upright. Old people waver, trailing the legs behind. Whole families die in a few days. The old Mrs. M. died quickly. The next day it was the turn of her husband, and then came the children, tormented by hunger and lice. One was a short-sighted fellow. He could not cope with the vermin, so his body was infested and crawled over his body and penetrated deeply into the skin, even into his eyelashes, his chest was all black from the lice and their nests. [...] The death has settled permanently among us, which is our most faithful room-mate, always and everywhere present. As a result of the outrageous treatment, the people die en mass, to hunger, humiliation, dysentery, vermin. They fall, they break down, their number ends, and decreases rapidly. Many of my friends have already finished their lives. One, two, three, four, [...] you are finally confused by the living and the dead. Basically the difference is minimal. We are skeletons that move, and others are skeletons that are already immobile. But there is a third category: those who lie still, stretched out, unable to move, and just breathe a little". Some of the prisoners who arrived with the evacuation transports to Bergen-Belsen, were admitted to barracks without any facilities, as Rudolf Küstermeier in the prison camp I writes: 'Finally, we were allowed to enter the barracks. They were no different inside from the outside. There were no beds, no chairs, no benches and no lights. The windows were broken, and there were no straw bags, or straw to lie on. There was only the greasy floor, and the rain came through the roof. We were told that we would not get anything to eat for the next two to three days, because the kitchens were not sufficient to cope for the new arrivals. We slept like sardines pressed together on the floor. There was no room to turn around or stretch out"
Since Bergen-Belsen hardly ever planned as a death camp, there was only a small crematorium, which was no longer sufficient to burn the now tremendously large number of corpses as quickly as possible. 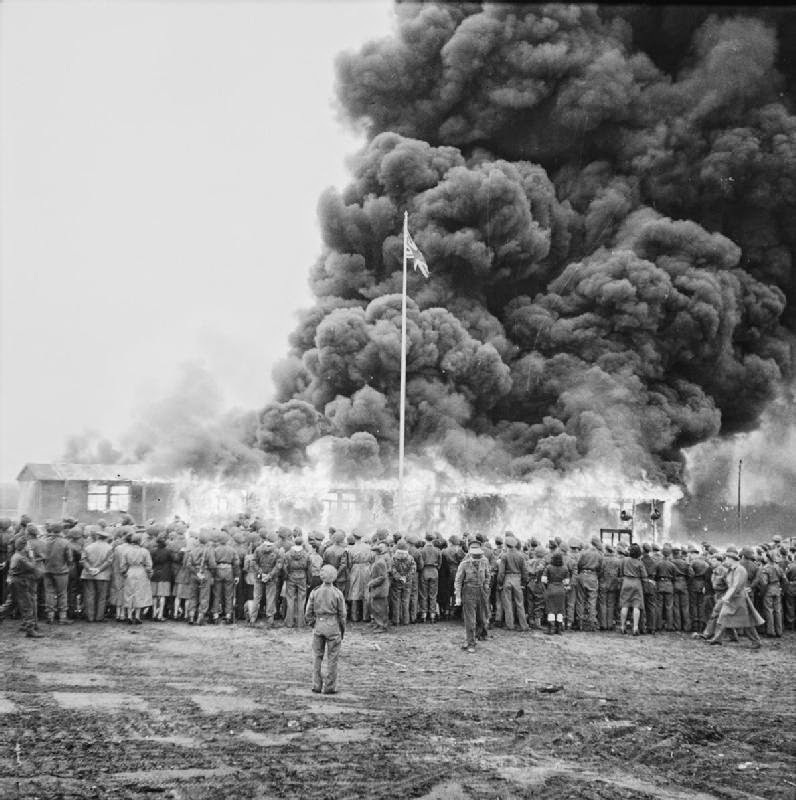 The attempt by the SS to remove the corpses by burning in an open field, failed because of the opposition of the Forest Service and the Military in the nearby Bergen-Hohne Military Training Area. So there was a lot of the corpses partly in the barracks, partly scattered on the camp grounds just lying to decompose. During the last few months of the camp’s existence the shortage of food was so acute that the prisoners (the camp staff were still well fed) resorted to cannibalism, and one former British internee gave evidence at the trial of the Commandant and some of his staff that when engaged in clearing away dead bodies as many as one in ten had a piece cut from the thigh or other part of the body which had been taken and eaten, and that he had seen people in the act of doing it. To such lengths had they been brought by the pangs of hunger. The practice of humans eating flesh from other humans is neither a strange nor rare practice around the world. This practice is thought to be most justified as a method of survival. Thus, the act of cannibalism taking place in the mortuary of Bergen-Belsen due to acute starvation and hunger is understandable. For prisoners to have to resort to such ‘inhuman’ measures, however, can often lead to much embarrassment and a devaluing of self-worth. Still, it would be erroneous to assume that the prisoner mentioned in the witness testimony speedily ate the chunk of human flesh because he was “naturally frightened of being seen in the act.” If this act referred to the prisoner being caught by Nazi officers for not following orders, that would be true. However, to assume that anyone would be appalled or would retaliate to see a prisoner commit “the act” of cannibalism is unlikely and unknown. 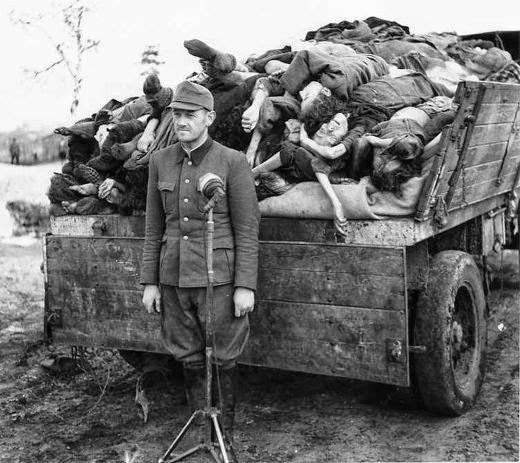 A few days before the liberation, the SS then undertook one last attempt to obliterate some part of the evidence of their crimes by forcing the ambulant prisoners to drag the corpses into mass graves. 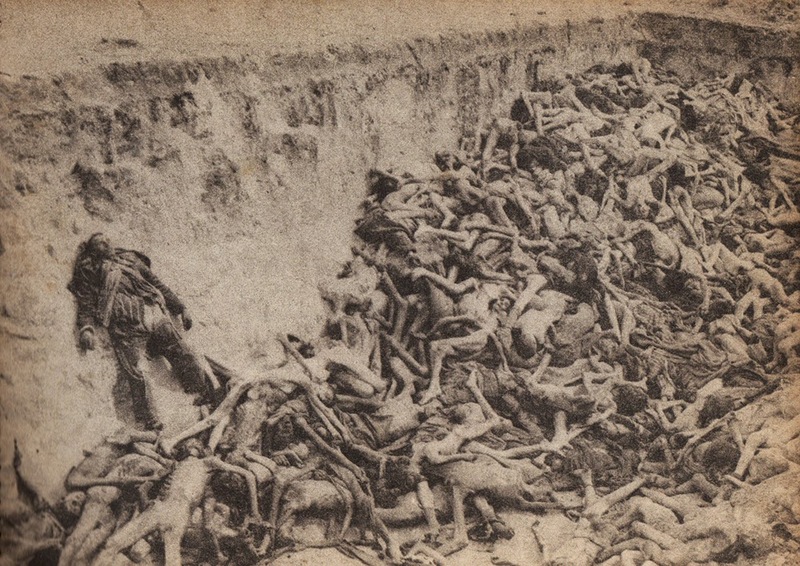 Again Rudolf Küstermeier explains: "Most of the bodies weighed no more than 80 or 90 pounds. But their disposal, irrespective of weight, exhausted us pretty soon, although it was usually two to three inmates that had to carry out this grisly task. There were not hundreds, but thousands of corpses, and everyone in the camp who could still walk, had to help. Leather straps, belts and torn blanket strips were tied around the ankles and wrists of the corpse and then they were often by four men dragged along the cobbled-stoned road to the other end of the camp. Almost every body was naked, because the clothing was stolen immediately after an inmate died, if the clothing was in a good condition and the naked body thrown out of the barracks. If it was unusable, it was either burned or hidden with the rest of accumulated trash. Most of the dead had no flesh on them, only skin and bones. Many of the bodies had been laying for days exposed to the elements and began to decay. [...] Two bands played all day dance music, while the men dragged the bodies into the mass graves. It had always been violins and guitars in the camp, while a few gypsies had often played their nostalgic melodies in the evening. But in the last few days there was for some reason a full orchestra . The SS encouraged this by giving them cigarettes, and so they played outside from morning to evening and we dragged the bodies over the cobble stones, while the the SS-men came down on us with sticks and whips usually on the stumbling prisoners, accompanied with the melodies of Franz Lehar and Johann Strauss. At the same time thousands of prisoners in the course of these evacuation transports were still brought to Bergen-Belsen. Their accommodation was only possible by the establishment of an additional camp complex at the barely two kilometres distance away from the Wehrmacht Training Ground (Truppenübungsplatz) Belsen-Hohne. 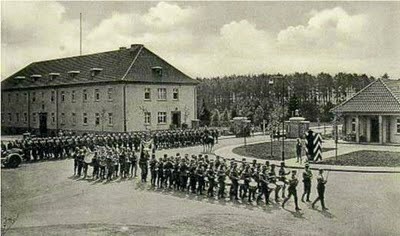 Termed as Camp II, also referred to as a sub-camp or barracks camp, part of the Training Complex (Truppenübungsplatrz) was vacated by the Wehrmacht and handed over to the SS. At the earliest on 8 April 1945 arrived here the first transport of prisoners. 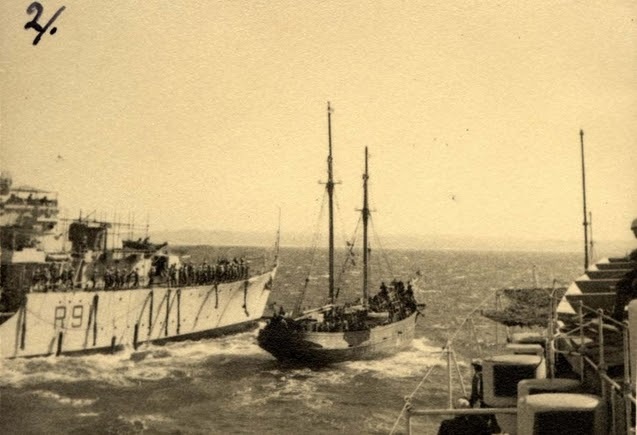 Overall, there were probably six shipments that arrived in this sub-camp, where they were no longer registered, given the initial chaotic circumstances. For them, it was almost without exception inmates of the camp Mittelbau-Dora and its satellite camps. The Jewish prisoners were here in the minority, the vast majority were political prisoners of Eastern European origin. 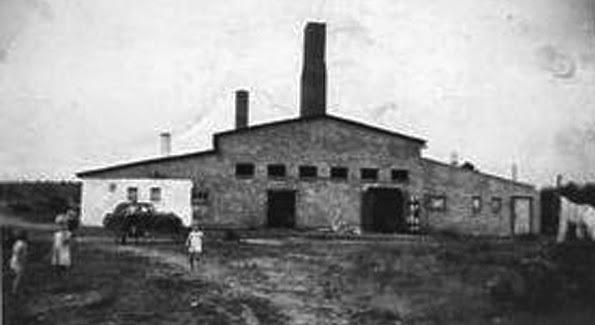 The two largest groups of prisoners interned, were Poles and Russians, which together accounted for more than 60 percent of the inmates housed in this sub-camp. A total of 15,133 prisoners were finally freed upon arrival of British troops. This sub-camp, had no work-details (Arbeitskommandos), and was purely a Transit or Holding Camp, without having further specific functions. It housed up to the liberation male inmates only. 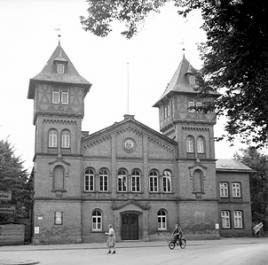 [German: NATO-Truppenübungsplatz Bergen or Schießplatz Bergen-Hohne) is a NATO military training area in the southern part of the Lüneburg Heath, in the state of Lower Saxony in northern Germany. It covers an area of 284 square kilometres (70,000 acres), which makes it the largest military training area in Germany. Under British control, the training area was steadily expanded and, since the 1960's, has also been used by the German Armed Forces (the Bundeswehr) and other NATO troops. Hoppenstedter Straße with Reichsadler above the door, still overlooking the entrance established by the Wehrmacht in 1935, at the end of the war it was taken over by British Occupation Forces and some of its facilities used as a liberation camp for survivors (designated as DPs - 'Displaced Persons') of the Bergen-Belsen Concentration Camp, which was located a few miles away. The camp would provide an ideal infrastructure for the DPs (Displaced Persons) to create a new community. The vast area of the Bergen-Belsen (Hohne) barracks was now divided into smaller camps. Camp no. 2 comprised the barracks and squares located at the south end of the complex, and those DPs requiring hospitalisation were accommodated here. DPs who were able to look after themselves were accommodated in Camp no. 3 which comprised the blocks and squares found near the eastern entrance of the camp (now the camp main entrance). Camp no. 4 was made up of the former Wehrmacht Officers married quarters found at the western end of the camp near the Roundhouse, and it became home to those DPs with surviving family members. The area that was to become known as Caen Barracks was camp no.1, which was bounded by the north gate (what was the main entrance in 1945), RB1 (Revier Barracke) and the Bergen-Belsen road. This area was fenced-off and would house units of the British Army of the Rhine (BAOR). Children outside one of the blocks in Neu Hohne now housing refugees. To begin with the population of camps 2, 3, and 4 was made up of many different nationalities, there were Russian, Polish, Czech, Hungarian, Romanian, Dutch, Greek, Yugoslav and French DPs, not to mention Gypsies and German political prisoners. The population of the camp was constantly changing as inmates were repatriated back to their homelands, to be replaced by former prisoners from other parts of the British Occupied Zone. But, of course, there were those who could not return, they were the Jews who came mainly from Eastern Europe. Their hope was that they would be allowed to emigrate to Palestine or find another country, such as the United States or Canada or in which to settle. Until this wish could be realised, they would, reluctantly call the Bergen-Belsen (Hohne) DPs camp, home. The seeds of organisation of the Jewish community where sown in the first days of liberation. Between the 15th and 18th April 1945 over 70, mainly Jewish, concentration camp inmates were shot by Hungarian troops used by the British to help control the camp population. This event signalled to the newly liberated prisoners that they would need to organise and protect themselves in order to rebuild their lives. Thus, in those first days a group of the more able prisoners in the overflow camp in the barracks (camp no.2) organised an election for the first temporary camp committee. All prisoners who could walk participated in the election and cast their votes. So on the 18th April 1945 in MB88 (Mannschafts Barracke) the first camp committee was formed under the Chairmanship of one extraordinary man, Josef Rosensaft. One of the blocks in Neu Hohne now housing refugees (Probably block H). Josef Rosensaft would hold the post of camp leader until the Bergen-Belsen DPs camp closed in 1950. Born in Bedzin, Poland in 1911 his father was a Jewish scrap metal merchant, and when old enough he started work in the family business, until, in 1943 he was deported to the concentration camp at Auschwitz. On the journey to the camp he managed to escape by jumping from the train into the river Vistula. Despite being shot in the leg he managed to avoid recapture and made his way back to the ghetto in Bedzin. He managed to evade capture until 1944 when he was again arrested and sent once more to Auschwitz, where another escape attempt saw him sent to the infamous punishment block 11. In November 1944 he was transferred to the camp at Buchenwald and then onto camp Dora-Mittelbau in 1945. In April 1945 he found himself evacuated to the Bergen-Belsen overflow camp (Camp No.2). Ber Laufer, Itzchak Eisenberg, Dr Tibor Hirsch, Dr Halina Grzesz, Dr A Klein, Dr Hadassa Bimko, Dr Zvi Helfgott-Azaria, Paul Treppman, and Rafael Gershon Olewski made up the committee. Once formed it began to oversee the rehabilitation of the survivors, by ensuring everything possible was done to improve the former prisoners' physical condition, assisting in the search for surviving relatives, fighting for their political rights and looking after their spiritual rehabilitation. It soon became apparent that the political fight for the survivors' political rights would take precedence over other tasks. 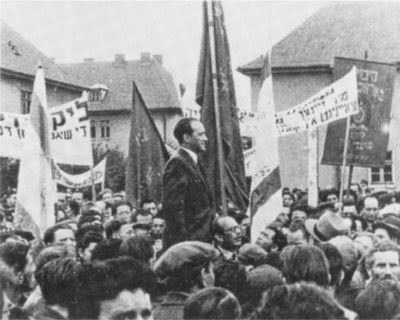 Taking a firm stance against the British Occupied Zone authorities became a way of life for Josef Rosensaft and his committee colleagues; they were stubborn adversaries and would prove to be a constant thorn in the side of the camp authorities. A protest meeting in the Bergen-Belsen camp, September 1947. For five years following the end of the war, British authorities maintained the camp as a "Displaced Persons" centre. During this period it flourished as a major black market centre. At this pro-Zionist gathering of 4,000 Jews, camp leader Joseph Rosensaft speaks against British policy in Palestine. British Lieutenant General Sir Frederick Morgan, chief of "displaced persons" operations in postwar Germany for the United Nations relief organization UNRRA recalled in his memoir that under Zionist auspices there had been organized at Belsen a vast illegitimate trading organization with worldwide ramifications and dealing in a wide range of goods, principally precious metals and stones. A money market dealt with a wide range of currencies. Goods were being imported in cryptically marked containers consigned in UNRRA shipments to Jewish voluntary agencies. In the first year they managed to force the authorities to climb down over the transfer of several thousand Jewish DPs to camps at Lingen and Diepholz. 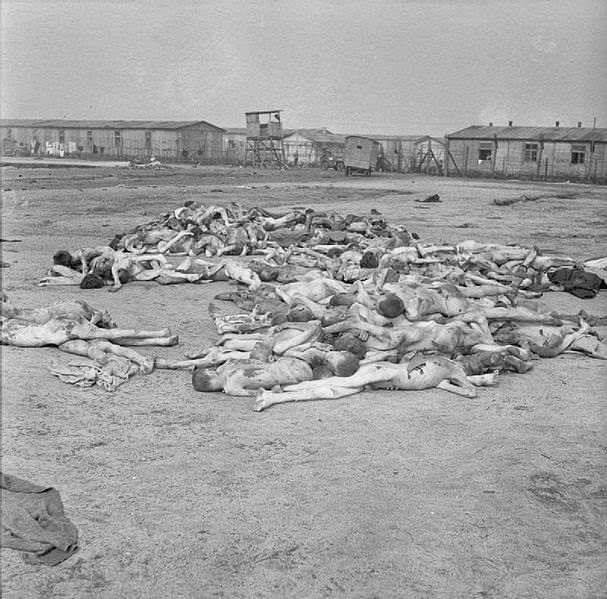 On arrival, these camps were found to be in such terrible condition, that the DPs refused to enter and demanded, successfully, to be sent back to Bergen-Belsen. Also, when the British authorities wanted to change the name of the camp from Bergen-Belsen to Hohne, the committee refused as they recognised the moral and political power of the name, feeling that this would assist them in the fight for emigration rights for the Jewish DPs to Palestine. Another achievement for the committee was that they managed, after some months, to persuade the military authorities to recognise the status of the Jews. After liberation, the military authorities would only segregate the former concentration camp inmates by nationality. This caused problems for the Jewish contingent of each nationality as anti-Semitism could still be found within the non-Jewish contingent. More importantly though, it had meant the Jews could not negotiate as forcefully with the authorities as they could if they were seen as a separate entity away from their different nationalities. This was an important victory for the committee. Soon many different military, relief and political organisations established themselves within the camp. The newly formed Jewish Committee, along with the HQ of the AJDC (American Joint Distribution Committee) took over part of the block L5 (Leutnantsblock), located near the Roundhouse in one of the former Wehrmacht Officer's married quarters. The Military Government Offices could be found in GB2 (Geschäfts Barracke) and the CCG (Control Commission Germany) moved into GB3. The Red Cross would also establish themselves with a presence in all three of camps, no.2, no.3, and no.4. The Jewish Agency for Palestine was set up in the Roundhouse. The camp became an important political centre, a fact illustrated by the number of important visitors it received, none more so than Earl G. Harrison, an emissary of President Truman. Harrison's mission was to find out about the problems of the DPs in Germany and to find ways to help them. Although he could not order migration to Palestine, his high profile brought global attention to the plight of the DPs. The growing political power of the Bergen-Belsen Jewish DPs was consolidated further when between September 25th and 27th 1945, Josef Rosensaft chaired the first Jewish Conference of the British Zone in Bergen-Belsen. There were many important Jewish leaders in attendance not to mention the presence of the world's press, who were also covering the first major war crimes trial, that of Josef Kramer the former Camp Commandant and the guards of the Belsen concentration camp in Lüneburg. This all served to highlight the DPs fight for political rights and ultimately the right to emigrate to Palestine. There became established among the Jewish DPs many different political parties from all spectrums of the political rainbow. There were General Zionists, Revisionists, Hashomer Hatzair, Mapai, Mizrachi, and Poale Zion. However, whether they were left wing, right wing or centre parties they all had the same political goal, the emigration to Palestine. The members of these parties would train the younger DPs for that life in Palestine, by forming collectives. Not only was there a political awakening amongst the Jewish population but also a spiritual one. The committee under Dr Zvi Helfgott-Azaria as Head of the Camp Rabbinate organised the religious aspects of camp life. Polish and Hungarian rabbis, religious writers and teachers would serve the whole camp. Religion would also become an important influence in Bergen-Belsen amongst all Jews not only those of the orthodox persuasion. During religious days the streets of the camp would be totally deserted as people attended prayers. Weddings took place and were carried out in accordance with Jewish law, as were other religious ceremonies. Bergen-Belsen also became a centre of spiritual guidance for those remaining German Jews in the towns and cities of the British Occupied Zone, where there were no rabbis to carry out religious ceremonies or synagogues in which to worship. With the Jewish Police station located in block GB5, public order within the camp was maintained without the presence of outside police or troops. The only major disorder found in the camp was the violation of the rationing laws and other administration regulations. The activities of these black marketers could be found on the square adjacent to block MB42, where a very active barter trade sprang up. Foreign currencies, cigarettes and other hard to find items were traded. A lot of the merchandise traded came from the occupation forces, whose own members were not averse to dealing in such illegal transactions. The education of the young became of prime importance and soon after liberation schools were being established in Bergen-Belsen. There were a variety of educational establishments such as the Jacob Edelstein primary school, the Jewish Brigade secondary school, the Trade School, the People's University, a library and evening classes for languages. The first Jewish newspaper was published at Bergen-Belsen in extreme difficulties. With no printing materials to begin with, the content was handwritten, until paper and printing equipment could be found. 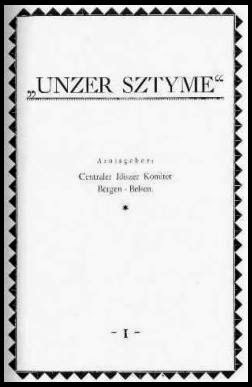 Finally a duplicator was obtained and the very first Jewish newspaper titled Unzer Sztyme (Our Voice) of the British Occupied Zone was printed and distributed in Bergen-Belsen. Following on from this success, the Jewish DPs press went on to print newspapers and magazines in Yiddish, Hebrew, German and English. The cultural side to life was the responsibility of the Central Committee's Cultural Unit. Samy Feder was part of the Unit and his role was to organise a theatre. He had bravely produced shows in the concentration camp before it's liberation, which had been a very dangerous thing to do. 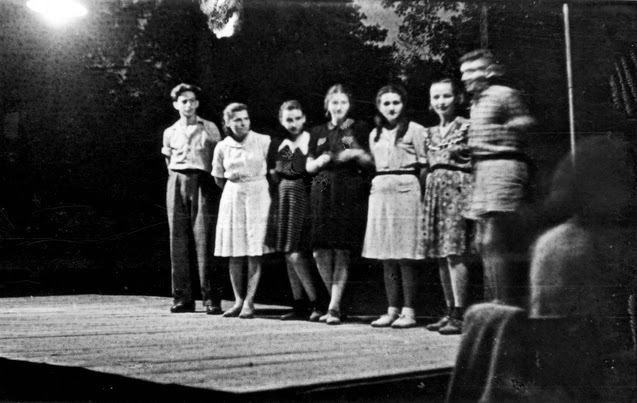 Although seriously lacking in resources, Samy Feder managed to form a troupe which became known as the Yiddish Theatre and three months after liberation they put on their first performance in the Zelt Theater (the tented theatre) which was located in the area due west of the swimming pool. The evening was a great success and played to a full house of over a thousand people, made up mostly of DPs, relief workers and some Russian Officers who had driven 200 hundred miles to see the show. Following on from this successful start both the Kazet (KZ) Theatre and the Workers' Theatre troupes were formed and went on to perform many plays. In July 1945, the Zelt Theater was also the venue for a music concert given by the legendary violinist, Yehudi Menuhin, who was performing to troops and former prisoners of concentration camps all around Europe. On his first visit to Bergen-Belsen he was accompanied by none other than Benjamin Britten. Sporting life became an important part of the lives of the younger members of the camp. The camp had an abundance of sporting facilities left over from its Wehrmacht days, with playing fields, gymnasiums and swimming pools. Sports clubs were soon established taking the names of famous Jewish Sports clubs of east European countries, names such as the Maccabi Sports Club, the Hagibor Sports Club, the Hatikva Sports Club and the Hapoel Sports Club. Life in that first year was extremely difficult for the DPs, but as we have seen they very quickly organised themselves into a self-governing community that was able to take the first steps back to some kind of rehabilitation. Under the able leadership of the Belsen Committee they were able to police themselves, educate themselves, and entertain themselves. These activities however, were all within the confines of the Bergen-Belsen camp from which they were not allowed to move, liberation had not produced the freedom it once promised. Only for a few prisoners was the hope fulfilled to be released in the course of an exchange-program from Bergen-Belsen. At the end of June 1944, 222 Jewish detainees travelled as exchange persons to Palestine. In July 1944, 70 Jews were able to leave Bergen-Belsen with British passports. During the so-called German-American civilian exchange at the end of January 1945, a total of 301 prisoners that left originally Bergen-Belsen. However, only 136 of them reached Switzerland. For some unknown reason the rest were placed in internment camps in southern Germany, where they found better living conditions than in Bergen-Belsen. Moreover, almost all the 1,683 Hungarian prisoners in the camp reached in August and December 1944 the Swiss border their freedom and 105 Jews from various European countries, which laid claim to the Turkish nationality, went via Göteborg [Sweden] in March 1945, to Istanbul. The vast majority of prisoners lived between the hope of tension and despair for release on the face of the ever deteriorating living conditions in Bergen-Belsen. The feasibility of an exchange was , however, the fact that in Bergen- Belsen in the months following, no open resistance ever existed and , aside from the prison camp proper , probably there were no escape attempts . This was the longer, the more likely deceptive alternate which ended all hope and meant for the prisoners , however, a serious mental stress on social relations and more often than not, self-destructive. 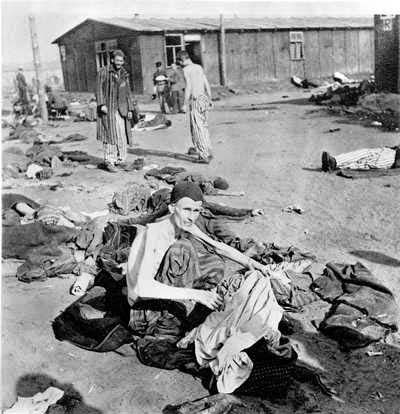 The arbitrariness , the uncertainty, the unpredictability of one's own fate was for the prisoners perhaps even more strongly felt than in other concentration camps, where , for example, the forced labour for the armaments industry (which in Bergen-Belsen did not play any role) represented for a prisoner still comprehensible rationality and to some extent a purpose to carry on . But in Bergen-Belsen your own life situation appeared to the prisoners more than contradictory and irrational : The living conditions were in an increasingly stark contrast to the established status of the detainees as "exchange hostages". 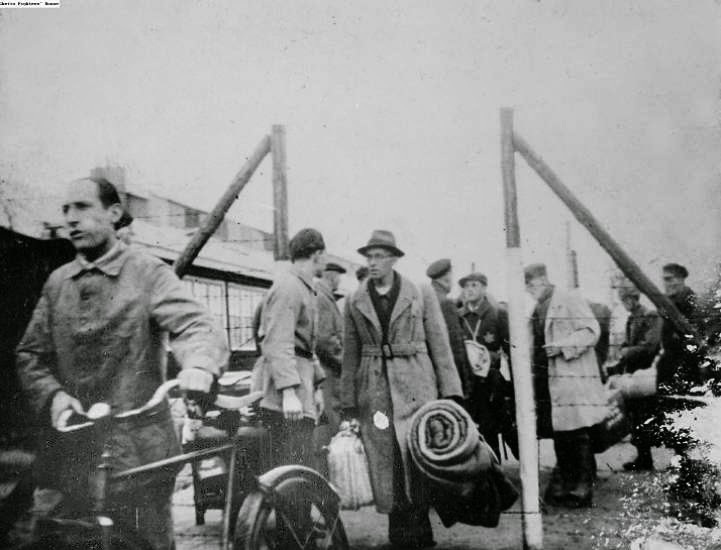 A particular status within the stay in the camp had the so-called 'Kasztner group' that arrived in mid-July 1944 in Bergen-Belsen and was placed here in handling transfers of internees. 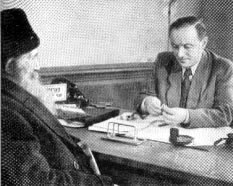 this group was a Zionist rescue project in the framework of negotiations between SS on one hand and a Zionist rescue committee in Budapest on the other, in which the Hungarian-Jewish journalist Rudolf Kasztner played the leading role. This Kasztner group presented on the whole a cross section of different religious and political-social groupings of Hungarian Judaism , but included a larger number of refugees, especially from Poland, Slovakia and Yugoslavia, at the time of the German invasion of Hungary they had mostly lived there with forged documents. The group should have left the country originally via Germany , France and Spain , the transport was , however, diverted , and finally delivered to Bergen- Belsen. Its fate depended on the progress of negotiations in Budapest, which hung again by a thread . The material conditions of Kasztner group were much better than those with the prisoners in the Star Camp , especially as the prisoners brought into this part of the camp, were able to bring a larger amount of food with them . Compulsory labour was not required, and the SS left them to a greater degree of autonomy than in the Star Camp . In August 1944, the first subjects of 318 persons, left after payment of ransom had been paid, they could leave Bergen-Belsen and go to Switzerland , almost all the other members of the Kasztner group were to follow them in early December 1944. Few days after this group had left Bergen- Belsen , the Hungarian Camp was occupied again with new transports of Hungarian Jews who were brought in part, directly from Budapest , partly from labour camps in Austria to Bergen- Belsen. These involved a total of 4,100 to 4,200 Jewish women and children, who were also considered as exchange prisoners. [Rudolf Israel Kastner (often spelled 'Kasztner') was an Austro-Hungarian-born Jew, Zionist activist, journalist and lawyer. He became known for facilitating the 'Blood for goods' proposal which was supposed to help Jews escape German-occupied Hungary during the Holocaust. He was assassinated in 1957 after an Israeli court accused him of having collaborated with the Nazis. [Minutes after midnight on March 4, 1957, Kastner was shot as he arrived at his Tel Aviv home. The attack was carried out by a three-man squad from a group of veterans from the pre-state right-wing militia Lehi led by Yosef Menkes and Yaakov Heruti. Menkes had also been a member of the post-independence terrorist group Kingdom of Israel. The assassination squad consisted of Menkes (the leader), Ze'ev Eckstein (the shooter), and Dan Shemer (the driver). The three men had waited in a jeep parked outside Katsner's house. Eckstein disembarked and approached Kastner as he locked his car, and asked him if he was Rudolf Kastner. When Kastner confirmed, Eckstein pulled out a handgun and fired three times. The first shot was a spent bullet, the second hit the car door, and the third hit Kastner in the upper body, critically wounding him. Katsner attempted to escape, but died of his injuries on March 15. In Gaylen Ross' film "Killing Kasztner" Ze'ev Eckstein presents a very different sequence of events and implies that someone else fired a fatal fourth bullet. See section "Documentary" below. About an hour after the shooting, Shin Bet (Israel's internal security service) opened an investigation, focusing its efforts on the Lehi veterans group led by Menkes and Heruti. The group had been linked to various murder incidents and various actions against Kastner, and it was suspected that Menkes bore personal responsibility. In addition, Kastner delivered a description of the assassins at the hospital. After a lengthy investigation, Shin Bet identified Eckstein, Shemer and Menkes as the assassins. Shemer was the first to confess his role, and implicated Eckstein, who subsequently confessed and implicated Menkes. In addition, police tracked down the jeep used by the assassins, which was found to contain the murder weapon and fingerprints belonging to Shemer. Subsequently, twenty members of their organization were arrested, including Heruti, and two weapons magazines belonging to the group were discovered. Eckstein, 24, stated that he killed Kastner to avenge his activities in conjunction with Nazi figures such as Adolf Eichmann. During the trial it turned out that Eckstein had been a paid informer of Shin Bet a few months before the shooting. The idea that the killing was a government conspiracy has been described by Elliott Jager as "absolute nonsense", because the head of the intelligence service was a close personal friend of Kastner. But recent documentation and some hints by people in Kastner's circles point to the possibility that the former head of the Jewish agency and at that time Prime Minister Moshe Sharet had been working together with Kastner on receiving the "Becher Treasure" – a huge amount of stolen Jewish money and property, for the country of Israel, and not into the hands of the Allied countries, let alone kept in the hand of the "former" Nazis. The price of freeing a small group of SS officers seemed at the time negligible, and fit in with continued ties that Kastner had with the Nazis at the end of the war. But the "Becher Treasure" turned out to be a fraction of the value expected, or at least by the 1950s the Israelis were convinced so, and it was all but impossible to start explaining the Jewish postwar compliance with captured Nazis to the public. Kastner's killers were given life sentences, but were pardoned after seven years. In January 1958 the Supreme Court of Israel overturned most of the judgement against Kastner, stating that the lower court had "erred seriously" in putting the emphasis on Kastner's moral conduct, leaving that "For history to judge". In an open letter by Tamir to the Tel-Aviv municipality, who were planning to call a street after Dr. Kastner's name, he showed that "Kastner was never given exoneration", but rather that it was only not proven if his actions which during the court case were unanimously agreed upon as being despicable, caused the murder or rather caused the failure of escape for over a million Jews from Hungary, deported and killed in the last months of the war. The court, he said, left that and only that to history. 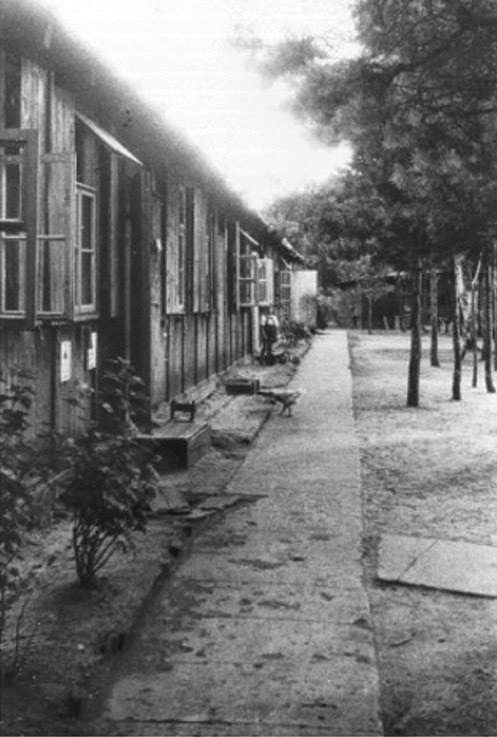 The first and only part of the camp, in which non-Jewish prisoners were housed, is referred to in the historiography as the 'prison camp'(Häftlingslager). This part, where only men lived, was operated from the beginning as a typical concentration camp and differed significantly from the situation in the Transit Camp. (Aufenthaltslager) It was first used to accommodate the construction commando. At the end of February 1944, it was disbanded and the surviving prisoners moved to other concentration camps Neuengamme and Sachsenhausen. The barracks of the prison camp were only for a short time empty. From the end of March 1944, sick prisoners unable to work were brought from other concentration camps into this part of the camp. From that point onward, it was the starting point for the following months, while more and more increasing the expansion in an entirely different direction of Bergen-Belsen, which would eventually change the character of this camp and the living conditions of the prisoners in a dramatic way. The first Patient Transport , arrived in late March 1944 in Bergen-Belsen , and consisted of exactly 1,000 prisoners from the concentration camp of Mittelbau-Dora , and was cynically designated by the SS as a "Recreation Centre" . But no serious efforts for medical care of the sick prisoners, who were eventually transferred back to their original camp, after their recovery, when inmate doctors and medication slowly arrived. The sick prisoners had initially to live for days in barracks without any type of utensils or equipment after their reception. They were totally undernourished and lived in catastrophic hygienic conditions and were, despite their poor physical condition, exposed to a sadistic regime of the SS and Kapos . The mortality rate in the prison camp was therefore alarmingly high . Just four weeks after their arrival in Bergen-Belsen more than a third of the prisoners had died of this Transport that came from Mittelbau-Dora . In the following months, further transports with sick prisoners arrived at the prison camp, by the end of of 1944 it was an overall total of about 4,000, of which 1,700 died by late 1944 over that same period, in other words shortly upon their admittance. Given the catastrophic living conditions in the camp area there were only few Inmate Doctors that had been transferred to the prison camp since the spring of 1944 but could hardly effectively help their ailing fellow sufferers (Leidensgenossen). These particular murders came only to an end when Karl Rothe had lost the protection by the SS doctors . A detainee tribunal sentenced him to death , and Rothe was later killed at night by fellow inmates in a shanty of the prisoner's compound. 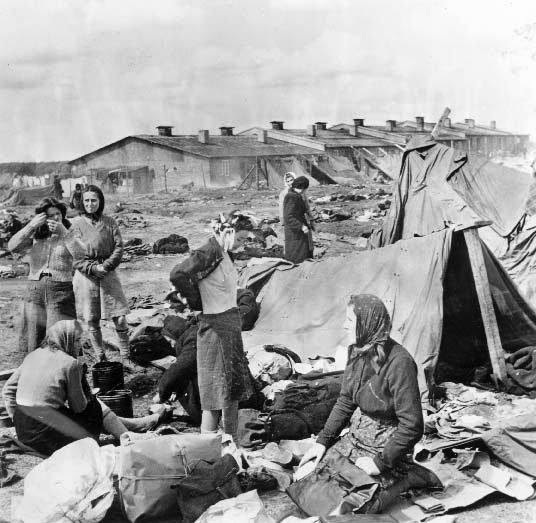 Women survivors suffering from Typhus in the Bergen-Belsen concentration camp'. Only once did the SS conduct a selection in the prisoner camp with the aim of transporting 200 supposedly healthy prisoners back, as forced labourers, to where they had come from . This transport consisted about half of the prisoners from the Mittelbau-Dora. The transport leaving Bergen-Belsen by the end of March , the remaining left at the end of July 1944 for Buchenwald. Conversely, the number of sick prisoners who were sent to Bergen-Belsen , did not decrease, and with the increase of frail and sick inmates the prison camp was gradually overcrowded . Parallel with this, Evacuation Transports from the East, which commenced by the end of 1944 with a high proportion of sick prisoners into the camp , so that the SS was eventually forced to use part of the previous Star Camp, in order to set up the Detainee Camp II , in the spring of 1945, and within a short time thousands of male prisoners were herded together, with the result that eventually from here, typhus spread right through the entire camp with devastating effect and with that, the Detainee Camp II had one of the highest death rates. With the establishment of a women's camp - Historians call it 'Small Women's Camp' - (Kleines Frauenlager). In the summer of 1944 began a second phase in the process of expanding the camp's function , which in fact was a further step towards the conversion from a "Holding Camp", to a "typical" concentration camp. In early August several large tents on the southern edge of the camp were erected, then in the middle of August , two transports with a total of 4,000 women and children arrived and had been admitted . These were mainly Polish subjects, who had been arrested and deported in connection with the National Polish-Warsaw-Uprising . Most left after a few days stay at Bergen-Belsen and sent further to satellite camps or other concentration camps to be used as forced labour. In the following months the women's camp had primarily the function of a distribution centre for women that should be used in the defence industry in other camps . On 23 August 1944, the first transport of women arrived from Auschwitz , who came within the prcess of the initial evacuation program of the women's camp from Birkenau. By early November 1944 a total of about 8,000 women from Auschwitz were transferred into the women's camp of Bergen-Belsen , among them was Anne Frank and her three years older sister Margot . Both died here in March 1945. 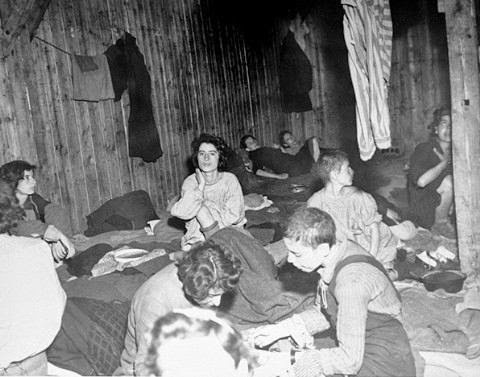 They, too were initially housed in the improvised tent camp until a heavy storm on 7 November 1944 destroyed most of the tents, so that new accommodation was required for the inmates of the women's camp, that eventually led to the use of a barracks complex at the "Small women's camp" , which had previously served as an SS clothing magazine and was located on the edge of the main camp . By the end of 1944 a total of about 13,500 women predominantly Jewish women, particularly from Poland and Hungary were deported to this part of the camp. With the transports from Auschwitz mainly Polish and Hungarian Jewesses arrived, but most of them were transported from here to work details into other concentration camps shortly after their arrival. Bergen-Belsen had within the vicinity at this time three Satellite Camps of their own, where most of the women were transferred to. Namely: The Army Ammunition Depot in Hambühren , at a Shooting Range of Rheinmetall Unterlüß and in the Explosive Factory Eibia & Wolf in Bomlitz. "JEWS FOR SALE": THE RUDOLF KRASZTNER TRANSPORT. ·During the years that the Nazis controlled Germany and then large parts of Europe there were numerous attempts to bribe officials in order to save individuals, including large numbers of Jews. These efforts, mostly futile, are described in Yehuda Bauer's Jews for Sale? : Nazi-Jewish negotiations, 1933-1945 (New Haven: Yale University Press, 1994). "He [Kastzner] was murdered for what some would consider 'playing God,' determining which Hungarian Jews to save from extermination during the Holocaust. Like Oskar Schindler, Kasztner negotiated with the Nazis to save lives. Unlike Schindler, however, Kasztner's actions and motives were questioned by Hungarian Holocaust survivors whose families were not included in the select group of Jews to be saved." The memorial site, the purpose of which is to resuscitate Kasztner's reputation, and is thus sympathetic to him states: "The prospect of saving Hungarian Jewry through ransom, odious as it appears, proved an alluring chance at beating the final solution to Kasztner and his associates.... A number of historians have also credited Kasztner and the Vaadah with saving the remnants of the Budapest ghetto and Kasztner in particular with saving the Jews who remained alive in places like Bergen-Belsen immediately at war's end. Despite the many lives saved and the heroic efforts expended it was clear at war's end that the grand plan of saving Hungarian Jewry failed. The record of Kasztner's heroism was buried under the rubble of that failure." Particularly interesting is the transcript of the interview by Claude Lanzmann with Hansi Brand, wife of Joel Brand, one of the members of the Relief and Rescue Committeee of Budapest (the Vaadah, or Vaadat Ezra ve'Hatzalah, generally referred to as the Vaadah, or the Committee). Hansi describes how the Hungarians thought they would escape the "Holocaust"; however, when the Germans invaded Hungary in 1944, their illusions were shattered. The Committee was established in 1943 to help Jewish refugees, particularly those from Slovakia and Poland, who had fled to Hungary to escape the Nazis. The leaders of the Committee were Rudolph (Rezsö) Kasztner, a Zionist from Cluj; Joel Brand, also from Transylvania and, in the words of Saul Friedlander, "something of an adventurer in politics" (Nazi Germany and the Jews, 1939-1945, p. 621), and Otto Komoly, an engineer from Budapest. Around March/April 1944 the focus changed to negotiations with Eichmann for the exchange of Hungarian persons for military trucks. Eichmann told Brand that 10,000 Jews could be saved for every truck delivered to the Germans. The final proposal was the exchange of 800,000 Hungarian lives for 10,000 trucks. Brand was to be allowed to go to Istanbul to raise the funds along with Bandi Grosz, another Hungarian Jew. On May 19, 1944 Brand met with the Yishuv (Jewish community in Mandate Palestine) representatives in Istanbul. The intricate details of the meetings of all parties-in Turkey, Palestine, and Syria -- are described by both Brand and Friedlander. Hansi and her children remained in Hungary, as hostages one presumes; but Hansi describes her meeting with Eichmann, which surprises Lanzmann. Brand's mission ultimately was not successful. Hansi brought Kasztner to meet Eichmann, which began the negotiations to bring the Jews from the provinces -- including Cluj -- to Budapest. "She says that Eichmann told her husband that he should hurry on his mission to Istanbul, because 12,000 Jews per day were taken to Auschwitz. Lanzmann questions Hansi Brand about the highly controversial rescue mission, the Kasztner Train (Lanzmann does not use this term), especially about the "privileged" nature of the transport and the 388 passengers from Cluj, Kasztner's home town." "Lanzmann says that Kasztner is sometimes criticized for not warning the Jews in Cluj, for example, about what would happen to them in Auschwitz. Hansi Brand says that is the most evil lie and gives examples of Jewish leaders from Cluj (she uses the German name of the town, Klausenburg) who knew quite well what Auschwitz meant. Lanzmann says that some people from Cluj who survived Auschwitz later complained that they were not told what it meant to be sent to the camp. Hansi Brand says that many people did not want to know that the Jews were being exterminated. She finds it impossible that anyone could not know by 1944 what was happening in German-occupied areas. She talks about the postwar Kasztner trial, in which Judge Benjamin Halevi believed the witnesses against Kasztner. 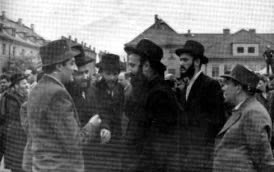 They continue to talk about how much information was or should have been given to the Jews of Cluj." A timeline of events is available at http://www.kasztnermemorial.com/apr44.html. A small part is excerpted below. April 5, 1944: Rezsö Kasztner and Joel Brand meet for the first time with Wisliceny and members of the SS. Wisliceny demanded $2 million dollars to implement in Hungary what was known as the "Europa Plan" - a suspension of deportations to concentration camps. April, 1944: The first installment of 3 million Pengos (Hungarian currency equalling about $92,000) is delivered by Kasztner to close associates of Adolph Eichmann. April 21, 1944: Kasztner delivers the balance of the $200,000 demanded as downpayment on the "Europa Plan." An offer is presented to allow the 600 holders of Palestine immigration certificates to leave Hungary and to permit an additional 100 to leave with them if Kasztner can provide a per capita payment of 100,000 Pengos (about $3,000 a head). April 25, 1944: Eichmann enters the negotiation process, inviting Joel Brand to be with him. Eichmann offers to "sell" one million Jews in exchange for certain goods to be obtained outside of Hungary. June 10, 1944: 388 Jews (out of 18,000 in the Kolozsvar ghetto) were brought to Budapest on a special train and placed in a "privileged camp" built in the courtyard of the Wechselmann Institute for the Deaf on Columbus Street. 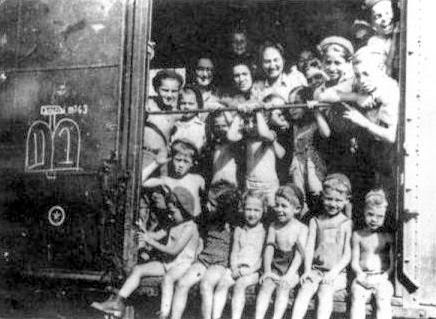 June 30, 1944: The Kasztner transport (1,685 persons) leaves Budapest. July 8, 1944: The Kasztner transport arrives in Bergen Belsen. July 18, 1944: Hungarian gendarmerie units arrest Kasztner and keep him incommunicado for nine days. August 21, 1944: First meeting between Saly Mayer, Swiss representative of the Joint Distribution Committee (JDC) in Switzerland, Kasztner, and Kurt Becher on a bridge linking Switzerland and Austria.The first 318 Jews are released from Bergen Belsen and transported to Switzerland. December 7, 1944: The second group of the Kasztner transport, consisting of 1,368 Jews, arrives in Switzerland. In the Kasztner Report, Lanzmann feels that Kasztner seems to express some guilt. There has been the accusation that Kasztner "saved certain people from Cluj (his own family and Zionists)." Lanzmann asks Brand to explain how people were chosen for the transport to Bergen-Belsen (the so-called Kasztner Train rescue mission). "She says that the types of people chosen varied greatly but included the most endangered refugees, Zionists, Jewish intellectuals, orphans, and rich people, whose wealth helped pay the $1,000 per-person ransom demanded by the Germans." Lanzmann asks Hansi why she thinks her husband's mission to Istanbul did not succeed and she replies "that the English did not want to help the Jews because they did not want to deal with the problem of Palestine. She says further that the Jews in Palestine were not informed as to what was happening. She ends the interview by defending her husband against historians who say that he did not return to Budapest out of fear for himself (Joel Brand was arrested by the British in Aleppo and eventually ended up in Palestine)." "The judge [. . .] derived from this contract the main explanation for Kastner's subsequent betrayal of his people: The benefit that K. gained from the contract with the Nazis was the rescue of the "camp of prominent Jews" and the price that he had to pay for this was a complete surrender of any attempts at real rescue steps benefiting the "camp of the people." The price the Nazis paid for this was to waive the extermination of the "camp of prominents." 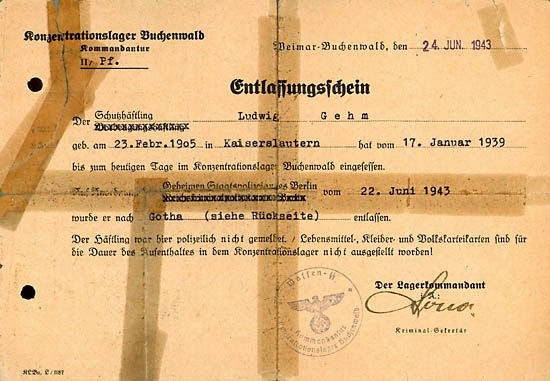 With this contract to save the prominent Jews, the head of the Aid and Rescue Committee made a "concession" with the exterminator: in return for the rescue of the prominent Jews K. agreed to the extermination of the people and abandoned them to their fate."